@ Homeless Center, Buddha Monthon 2 Rd. 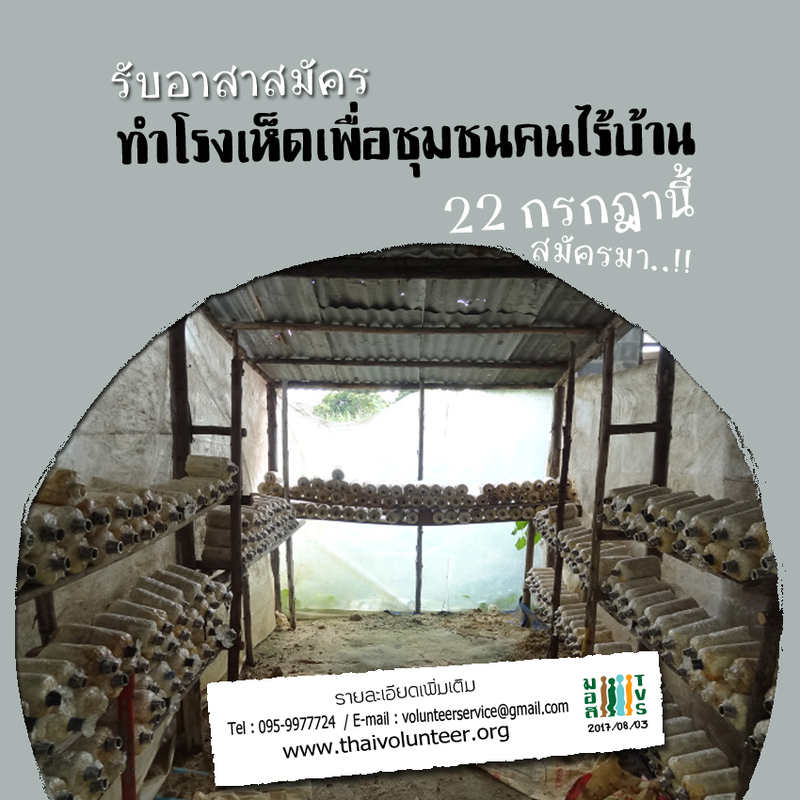 สมัครได้ทางธนาคารจิตอาสา หรือกรณีสมัครทาง e-mail ที่ volunteerservice@gmail.com โดย ระบุกิจกรรม “เพื่อคนไร้บ้าน 22 กรกฎา’” ชื่อ/สกุล ….. อาชีพ…. E-mail ….. เบอร์โทรศัพท์…. “Sharing to homeless people Project” a volunteer activity to support homeless people to have a better quality of life and safety. We develop several activities that are necessary for a group of homeless people to develop the environment, building temporary habitat and the factors necessary for living. All of you know, there are basic 4 factors of human living, but there are a number of mates in our society do not have the life security that is homeless people group – disadvantaged groups. Homeless people are from a variety of causes that reflect social issues; poverty, inequality, social conflict, the injustice access, opportunity, and many other factors. When the status of homeless people, makes these people’s social status was sidelined by an external point of view, like a lazy incompetent awesome etc., so no one curious to know the facts and give opportunity to them, make the more neglected and homeless people dropped from opportunities, hard into the job search and self-reliance. There are several sectors have seen the importance of creating opportunities for homeless people. Our volunteer projects as a bridge to share for homeless people. Apply at volunteerservice@gmail.com Name ….. Email …… Phone…… . Please inform us at volunteerservice@gmail.com after you transferred to the account.